BLAG • View topic - blag, freed-ora and what to do. Post subject: blag, freed-ora and what to do. So I think guys using freed-ora may use blag forum to ask for support or for giving help to the others. You know too, you may install blag icons theme (Thanks to veganix) on it and run something like a blag. And maybe if we are some guys chatting about this here we'll go to a new blag release. With a little help from our friends (Thanks to the Beatles) we'll build something. Happy New Year to all the old chaps and the new ones! Post subject: Freed-ora19 & a Unique Unix Comprehension of Freedom ? does installing Freed-ora need a full comprehension of the Kernel and how Unix file system works?.. Another point is failed to boot into Fedora19(black screen)Older Iso recommended. Older Libre kernel as well? Many questions from a beginner. Does it boot with the non-free kernel? Did you update after installation? 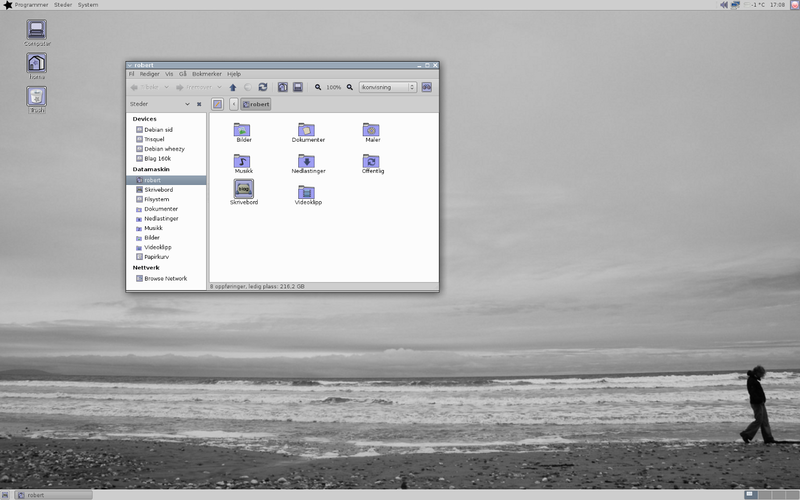 >@<Have just tried Xfce fedora Kernel 3.9.5-301 fc19.i686 and it boots successfully.!! ....But! its desperately staying installed with American keyboard set-up;like when one tries out a Live CD..am using French Keyboard Azerty.Rebooted and reset it to French but no success,language in French(good)but Keyboard no..
must be possible change keyboard set_up to Azerty once installed.with the terminal? I know you have the flu at the moment so no hurry in answering++++I'll check out the Fedora Sites.& do some searching..In the meanwhile "prends soin de toi et bon rétablissement." I didn't have any problem to have an azerty French keyboard. So don't know what happened to you. One has to select keyboard conf by default..
Yum is not recognizing my root password..
but ended up again in Us keyboard conf. it concernsSuisse-Allemand. Language...no bug then..
4 boots 3 wrong keyboard set-up & no root password..
5)Unable to login on the 5th boot! !password not valid..
sets back to Us thus rendering the valid password invalid.........! I was unable to login on the 5th boot. Don't know what you have done during installation; never had that kind of problem since a long time. Do you use a hard installation or a vm machine? The current anaconda installer has improved slightly since fedora 18, but is still not very user friendly. Did you change the keyboard layout in the settings menu before running the installer? This seems to mess up keyboard settings. this resets the Keyboard to US...the User Creation is then only possible with Us conf. It worked once =i had French keyboard and Language(Good for me). Looks like Freed-ora is as hard as finding Free-Oro..! toto no longer finding it rigolo..
any difference between US & UK...? Last edited by tristan on Thu Oct 17, 2013 11:15 am, edited 1 time in total. Post subject: Default Root Password Script On Fedora 19 Installer ? I cannot even log ...in . it sets itself back to ""Us configurations...thus even invalidating the root password!! I mean i have tried 8 times...! it boots fine..thought. I even tried Arch Linux wich booted fine...no Language or Keyboard bug..
some bugs (30%)of course but always error messages on the boot such as Sabayon MATé ( NVIDIA) Salix(Slackware)would not load Lilo. Or debug this..issues>conflicting .. The completed spoke shows "French (French (Canada))", the install completes, but after reboot, I have US keyboard layout at the console, and vconsole.conf says KEYMAP="us". installer bug...So i booted in all 14times..
in the meanwhile i also tested my Gf's brand new azerty keyboard thinking that it may be a hardware issue..maybe building up to a Libre Kernel is going to be even harder. (uh)..+ could not find a Qwerty keyboard anyhow.. There is now another way to have a 100% free fedora: Install:http://gdnewhat.org/ that is 100% free; replace gnome 3 by xfce; replace (if you want) claws mail by sylpheed; and add blag icons and theme. I sent a email to taro (the guy from gdnewhat) to ask him if there is a IRC channel or something like that to discuss with them.